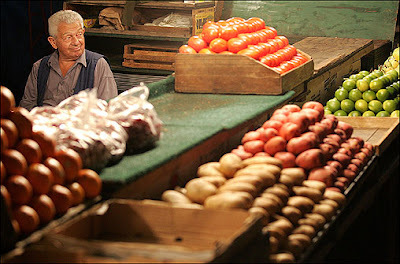 Here in Boston we have this year round open-air market every Friday and Saturday from dawn until dusk. It's called Haymarket and for some odd reason, the only time I've ever been there was one day I was doing some photography and walked through to take a couple of photos (this is not one of them sadly, it's from Boston.com). I am always wondering how I can save money on produce and also buy in season and the answer has been right down the street from my office all along. The plan is to wake up early on Fridays and go into the market on the way to work. It just makes so much sense! Starting this blog, going gluten-free, creating my first recipe and posting it here, all of these things are really helping me to move forward with this new lifestyle. Sometimes I even forget that I actually have a digestive disease, and think that I'm just doing this because it's so healthy and fun. It is becoming so much fun, I'm so inspired! It's really a great feeling. I made way too much pasta salad though so I've been eating it all day today. I'm still really impressed with myself for pulling it together. For years I've been thinking of doing more cooking and now I'm actually doing it. I love that. Thanks everyone for the comments and visits to the blog, I'm so excited to be getting out there! Now that I've been doing this for a few months I'm starting to get a good sense of where I want to go with it. Stay tuned for more gluten-free recipes, product reviews, restaurant reviews as well as a peek into the (hopefully) exciting life of a 28 year old single girl in the city. I've always loved to write and was an English major in college and I'm glad to finally be putting it to good use!! Today my roommate Katie and my friend Meag ran in the Harpoon Brewery 5 miler so my cousin Lauren and I headed over there to greet them at the finish line. I wasn't too concerned about the fact that this was at a brewery because it was 11 in the morning and I didn't anticipate drinking. When we got there I was pleased to see that Harpoon has finally put out a cider! It wasn't the best cider I've ever tasted, and to be honest with you, I asked the guy pouring the drinks if it was gluten-free and he didn't know, but I risked it anyway. The website says it's made purely from apples only and I do plan on emailing them to be sure. My office is 2 doors away from the home of one of the owners so that helps. I actually had planned on asking them if they had any plans to come up with a gluten-free beer, but in the meantime I'll take the cider. Harpoon Brewery puts on a bunch of festivals throughout the year and I used to go all the time and was pretty bummed when I could no longer drink beer. Today was Summer Session in the afternoon and I could've gone back after the race but I got a sunburn, it's ridiculously humid today, and I just didn't feel like going back. But I will definitely be hitting up Octoberfest this year! Ok, I just went ahead and sent them an email checking on the gluten content of the cider and also asking about future plans for a gluten-free beer. I'll let you know what I find out! ETA: I found a thread on the celiac.com forums that says it is in fact gluten-free. I will still update you on what Harpoon says in the email.